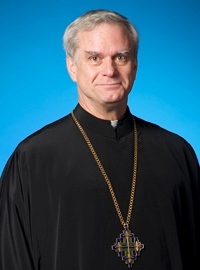 At its January 28, 2013 meeting, the Holy Synod of Bishops established the Department of Continuing Education to provide for the ongoing development of clergy and lay leaders. The Holy Synod simultaneously mandated a continuing education requirement of twenty hours annually for all priests and deacons. The Department carries out its mandate primarily through the Continuing Clergy Development (CCD) program. To carry out the continuing education mandate established by the Holy Synod of Bishops for clergy and lay leaders. To recommend standards for Continuing Clergy Development (CCD). To create and deliver continuing education offerings and materials in response to periodic needs assessments and the demands of the national church. To foster collegial clergy and lay leader development by recruiting presenters and their offerings. To collaborate with other departments, diocesan and local bodies, and seminaries in the creation and delivery of CCD offerings. To maintain records of CCD accredited offerings and clergy compliance with CCD standards established by the Holy Synod of Bishops. The Department is staffed by a Director and any necessary support personnel. The Director reports directly to the Holy Synod of Bishops. Needs Assessment Survey: Help us prioritize our work! Clergy Field Manual – Call for Author/Contributors: A booklet on everything they didn’t teach in seminary – for clergy and lay leaders. Become a CCD Presenter: Do you have an idea for a workshop, retreat or seminar? Submit a proposal to have your offering accredited for CCD. Clergy: report your CCD hours with our online form.